This popular, trendy restaurant and bar provides a welcome gourmet flare in the area. Beautiful interiors, a vibey atmosphere and a menu that will leave you spoilt for choice is available. Cuisine ranges from regional dishes to European and Latin delicacies. 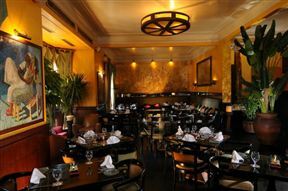 La Bodega is 2.1km from the centre of Cairo , the nearest airport 2894.1km (Lokichoggio Airport).